The champions for the 2019 Dakar cross-country rally has been crowned with Nasser Al-Attiyah winning the Car category and Toby Price taking the Bike class. The Qatari with co-driver Mathieu Baumel scored Toyota’s first Dakar Car win and his career’s third while Price abode the KTM 450 Rally continued the Austrian manufacturer’s dominance in Bike with his career’s second victory. Meanwhile, the Quad category had a Yamaha 1-2-3-4-5 with Nicolas Cavigliasso winning from Jeremias Gonzalez and Gustavo Gallego with Francisco Lopez taking the SxS class win in the Can-Am Maverick UTV. The Truck category went to the crew of Eduard Nikolaev, Evgeniy Yakovlev & Vladimir Rybakov as they led a Kamaz 1-2 with Dmitry Sotnikov, Dmitry Nikitin & Ilnur Mustafin in second as Iveco’s Gerard de Rooy, Darek Rodewald & Moises Torrallardona were third. Stage 1: Al-Attiyah started the 2019 Dakar in Peru in style topping the opening stage in his Toyota Gazoo Racing South Africa car ahead of the X-Raid Mini pair of Carlos Sainz (co-driver Lucas Cruz) and Jakub Przygonski (co-driver Tom Colsoul). On the Bike side, Honda’s Joan Barreda kicked off with a stage win with his closest challenger being Husqvarna’s Pablo Quintanilla all day long as Honda’s Ricky Brabec completed the Top 3. Stage 2: The second stage saw Sebastien Loeb (co-driver Daniel Elena) in his PH Sport-run 2017-spec Peugeot 3008 DKR set the pace to be fifth overall with Mini’s Nani Roma (co-driver Alex Haro Bravo) on his tail. Toyota’s Bernhard ten Brinke (co-driver Xavier Panseri) was third as Stage 1 leader Al-Attiyah dropped to eighth overall after a difficult run in the stage. The rally saw a new leader with Toyota’s Giniel de Villiers (co-driver Dirk von Zitzewitz) taking top spot. The South African was followed by Bernhard ten Brinke and Nani Roma in second and third overall. Meanwhile, the Bike class saw reigning champion Matthias Walkner on top abode his KTM ahead of Brabec and Joan Barreda. The lead of the rally remained with Honda’s Joan Barreda but Walkner’s improved run helped him to move to second overall as he leapfrogged Brabec in the process. The Stage 1 second-placed rider Pablo Quintanilla dropped to fourth overall. Stage 3: The third stage belong to X-Raid Mini’s Stephane Peterhansel (co-driver David Castera) after a commanding run to leapfrog to third in the overall standings from 13th after Stage 2. Stephane Peterhansel’s closest competitor was Al-Attiyah. The Qatari fought back to regain the rally lead after finishing second in the stage as de Villiers’ mechanical issue dropped him to 40th overall. X-Raid Mini’s Yazeed Al-Rajhi (co-driver Timo Gottschalk) surprised everyone to finish fourth in the stage. The Saudi Arabian driver was placed second overall ahead of Stephane Peterhansel. With de Villiers, disaster also struck to Carlos Sainz with his hopes to defend the 2018 crown dashed pretty much with a broken suspension – the Spaniard dropped way down to 36th overall. The Bike stage had more dramas in check with rally leader Joan Barreda was forced to retire for the second year in a row when he got stuck in a dip. The fall of Barreda was followed by problems for Walkner and Brabec as well as both lost their way. Yamaha’s Xavier de Soultrait took advantage of all to score his first Dakar stage win from Pablo Quintanilla and Honda’s Kevin Benavides. The trouble-free run for Husqvarna’s Pablo Quintanilla helped him to take the lead with Benavides in second and KTM’s Sam Sunderland third. Stage 4: It was a relatively calm run in the fourth stage as Al-Attiyah extended his advantage in the category with a win as Stephane Peterhansel’s improved run in his Mini helped him to not only finish second in the stage but also be second overall. Mini’s Przygonski ended up third in the stage and was fourth overall with Roma slotting in third overall. Stage 3 second-placed driver Al-Rajhi had a difficult run and dropped to fourth overall with Sainz and de Villiers on their recovery run. The Bike category saw a new leader as Brabec fought back on his Honda to win the stage handsomely from a recovering Walkner. A bad day for Pablo Quintanilla meant he dropped to second overall as Price slotted in third – both in the stage and overall standings. Stage 5: The fifth stage belonged to Sebastian Loeb as the Frenchman topped it in his Peugeot from Al-Attiyah, who still leads the rally comfortably from Stephanen Peterhansel and Nani Roma – the latter finishing third in the stage. Like Stephanen Peterhansel, even Nani Roma lost time to Al-Attiyah with fourth placed Przygonski and fifth placed Sebastian Loeb gaining on the Spaniard. The Bike category had Honda’s Brabec in overall lead despite finishing only eighth in the stage. The American now has KTM’s Sunderland on his tail after the British racer took the stage win – provisionally he was second with de Soultrait winning but with Sunderland stopping to help a rider, he was given back the lost time. Sherco TVS’ Lorenzo Santolino did well to end up third in the stage while Husqvarna’s Pablo Quintanilla finished third overall after a bad day for the Chilean rider, who only managed a 12th place finish in the stage. Stage 6: Following the rest day, Toyota’s Al-Attiyah continued his lead in the Car category despite finishing second to Peugeot’s Sebastian Loeb in the sixth stage. The Frenchman took another stage win to move into second place overall. He displaced Mini’s Stephanen Peterhansel who dropped to third with Mini’s Nani Roma in fourth. The recovering drive from Sainz was going on point as the Spaniard rose to 11th after finishing third in the stage. The up and down scenario in Bike continued with Pablo Quintanilla taking over the lead again by winning the stage on his Husqvarna. He had Honda’s Kevin Benavides on his tail in the stage which helped the Argentine move to fourth overall. Brabec, meanwhile, lost his lead to be second after finishing only fifth. KTM’s Sunderland also lost out to be seventh as KTM’s Price rose to third overall after finishing fourth in the stage behind Walkner. Stage 7: The Car category continued to be led by Toyota’s Al-Attiyah despite the Qatari not finishing inside the Top 3 of the stage. Mini’s Stephanen Peterhansel stage-winning run helped him to second overall with Roma’s second place put him back in third overall. 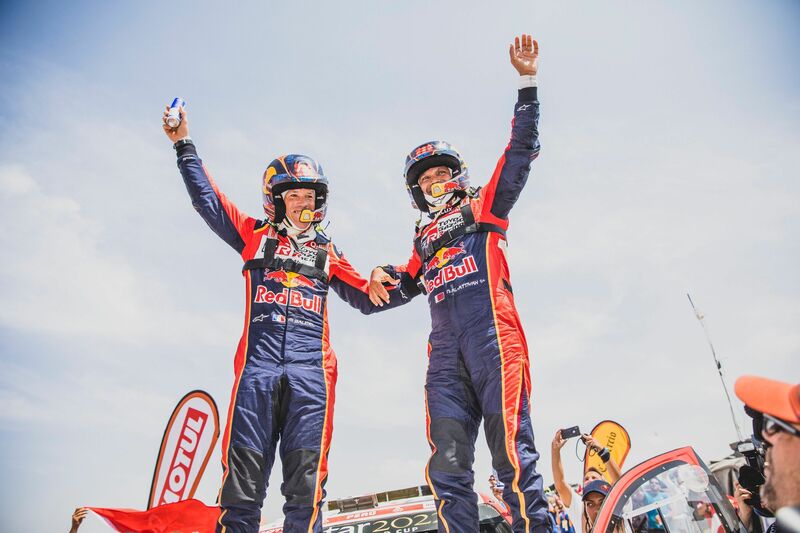 Peugeot’s Sebastian Loeb dropped to fourth after a slightly difficult run while Mini’s Carlos Sainz continued his upward movement with the Spaniard finishing third in the stage to break into the Top 10 in his recovery drive. The Bike stage had Brabec in the lead again after finishing third in the stage on his Honda. The stage was dominated by KTM’s Sunderland who moved to fourth overall with Honda’s Ignacio Cornejo surprising with a second place finish behind Sunderland. A consistent run from KTM’s Price helped him to move to second overall Yamaha’s Adrien van Beveren improved to third overall. A difficult day for Husqvarna’s Pablo Quintanilla meant the Chilean dropped to fifth overall. Stage 8: Toyota’s Al-Attiyah had his Car category lead in check after finishing second in the eighth stage behind Peugeot’s Loeb, whose stage win helped him to move into third overall behind Mini’s Roma. The title bid for Mini’s Stephanen Peterhansel took further hit when got stuck twice in the dunes as he dropped to fourth overall. Mini’s Przygonski stabled himself in sixth overall after finishing third in the stage as Toyota’s de Villiers was back in the Top 10. The Bike category saw a big retirement with front-runner Brabec facing an engine failure on his Honda as KTM’s Price took over the rally lead after finishing third in the stage which was won by his teammate Walkner. The Austrian sits third overall with Husqvarna’s Pablo Quintanilla in second overall after finishing in the same position in the stage. The Chilean managed to regain the Top 3 place after van Beveren dropped to fifth. Stage 9: Toyota’s Al-Aittyah maintained his lead with a ninth stage win ahead of Mini’s Nani Roma – who was not only second in the stage but also sits second overall. Loeb’s fourth place finish helped the Peugeot driver to keep his third position in check. Toyota’s de Villiers‘ third place finish helped him to gain more places to be eighth overall as the stage saw a big retirement with Mini’s Stehanen Peterhansel bowing out after a crash injured his co-driver while Cyril Despres had a roll over as well. The Bike category saw KTM’s Price extend his lead despite finishing fourth in the stage which was won by newcomer Michael Metge abode the Sherco TVS – the team’s second stage win of the 2019 Dakar. The Frenchman had privateer Honda’s Daniel Nosiglia in second with Husqvarna’s Pablo Quintanilla in third. The Chilean is second overall behind Price with KTM’s Walkner in third after the Austrian finished fifth in the stage. Stage 10: It was just for Toyota’s Al-Attiyah to see-through the final stage to secure his third Dakar win – his third different manufacturer as well after Volkswagen and Mini. The Qatari did not even needed a Top 3 finish to win the rally. Mini’s Nani Roma ended up second overall even though he did not win any stage while Peugeot’s Sebastian Loeb rounded out the podium after finishing second in the stage which was won by Mini’s Carlos Sainz, who was classified 12th eventually. Mini’s Cyril Despres recovered from the fall in Stage 9 to be third in the final stage and fifth overall behind Mini’s Przygonski. Ford’s Martin Prokop was sixth in the overall standings with Mini’s Al-Rajhi in seventh. The Top 10 was rounded out by Mini’s Boris Garafulic, followed by the Toyota pair of de Villiers and Ronan Chabot. The Bike class, meanwhile, saw KTM’s Price eke out his second Dakar win after winning the final stage. The Australian led a 1-2 with Walkner ending up second after a late crash for Husqvarna’s Pablo Quintanilla dropped him to third overall. The Chilean had his teammate Andrew Short in fourth with Yamaha’s de Soultrait in fifth. Honda’s Cornejo finished sixth after ending up second in the final stage with KTM pair of Luciano Benavides and Sunderland in seventh and eighth overall, while Hero Speedbrain’s Oriol Mena was ninth and Honda’s Nosiglia in 10th. UPDATE: Following the end of the rally, the organisers took back a one-hour time penalty of Sunderland from his total time which propelled him to third in the overall standings in a KTM 1-2-3 as Pablo Quintanilla dropped to fourth as a result.